No matter what the use case may be, knowing how to manipulate texts (strings) would be a huge help in building interactive forms. So in this guide, we'll be focusing on the Use Cases mentioned above. Your imagination and creativity would only go as far as how you understand Conditions and Calculations. a. Create the fields needed for the link/URL to be generated. 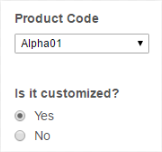 In the example form we'll be working on, there are only two options - The product code (a Dropdown menu) and whether it's customized or not (a Radio Button). b. Add the Textbox field that will fetch the generated URL. You would notice that there are no operators needed (e.g. no need to add or use the + sign operator to concatenate the texts). Just type them in directly then add the field(s) in between when needed. a. 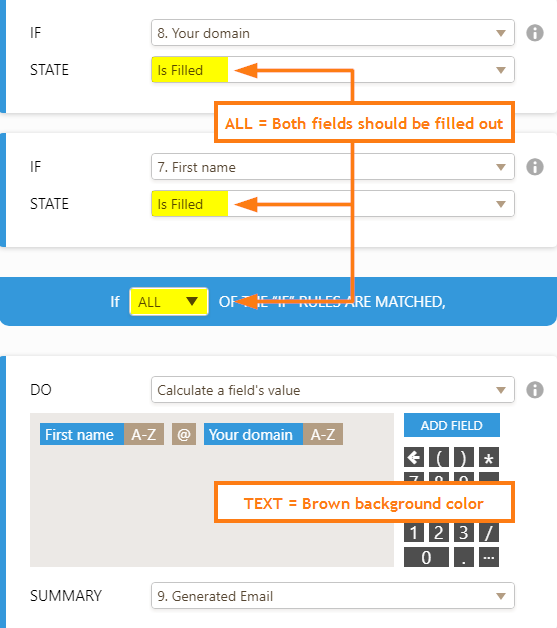 Create the fields needed to generate a well-formed email address. The part before the @ symbol (local-part) identifies the name of a mailbox. This is often the username of the recipient, e.g., jsmith. The part after the @ symbol (domain) is a domain name that represents the administrative realm for the mail box, e.g., a company's domain name, example.com. In our example form, the local-part would be a Textbox and the domain would be a Dropdown menu with predefined domain options. This will be the Condition to populate the other Textbox that will fetch the calculated text. Just like the previous method, you won't need to use operators to concatenate texts/strings. Just type them in - This time, you add the Textbox field, an @ symbol, then the Dropdown field. Lastly, to achieve this, the same idea/principle still applies. Just add the fields needed and append the comma in between them while ensuring all of them are rendered as texts/strings (with a brown background). 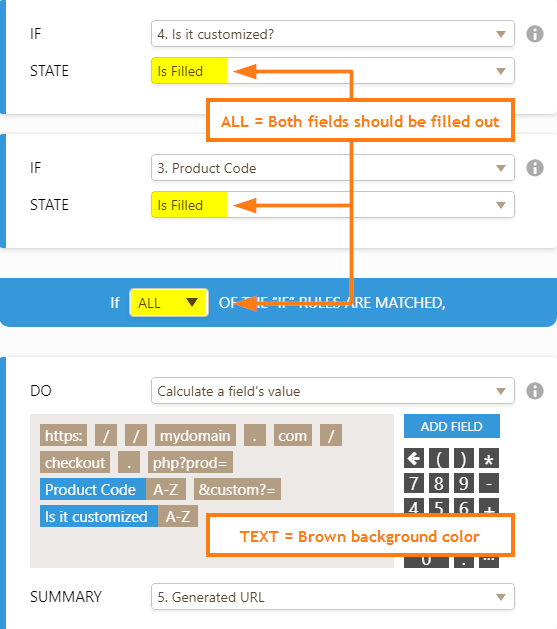 🔘 Anything you manually type in the Calculate field will be treated as text by default (with brown background). 🔘 Any field you add (when you click the ADD FIELD button) will be added as a number by default (with black background). 🔘 If you wish to toggle back and forth from text to number (and vice versa), just click on each block. 🔘 Pressing the TAB key will automatically render the text you typed in as a block of text/string. 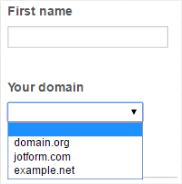 Here's the completed form https://www.jotform.com/63606604095961 so you can see it in action. Or just watch the short clip below to see how it works. You can clone this form, here's how, so you can have a closer look on how it was setup. Give it a whirl and don't hesitate to leave a comment if you have questions. when I attempt to auto-generate emails on my form, the text fields will not accept any text. I'd like to have in my form a question that asks for the state of the driver's license. I imagine it would be just a single selection question. I would like there to be a condition that requires the person completing the form to enter a format that aligns with each state's Driver's License number format. For instance, in Colorado, only 9 numbers are used. So first I would like them to answer a question asking which state. After selecting Colorado, I would another question to pop up that asks for the Driver's License number and requires 9 numbers (doesn't allow shorter or longer responses, and doesn't allow letters or other symbols). Each answer in my form is equal to a certain value. At the end of the form the score is calculated. I have 4 different explanations for the scores from 0-7, 8-15, 16-24 and 25-35.
so that just one of the 4 explanations becomes visible in that textbox for the given values above? 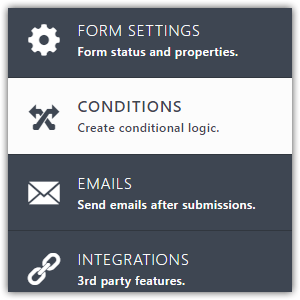 Is it possible to use the comma-seperated values on the form calculation widget? Can you redirect based upon the generated URL? So when you hit submit you would be taken to: https://mydomain.com/checkout.php?prod=addFieldHere&custom?=addFieldHere in the example above. I'm trying to generate a URL string that contains square brackets, but the form removes them after I hit Save.